Ultraviolet and visible light emitted by all the stars that ever existed is still coursing through the universe. Astronomers refer to this "fog" of starlight as the extragalactic background light (EBL). Image released Nov. 1, 2012. This story was updated at 3:00 p.m. EDT. Astronomers have spotted light from the very first stars in the universe, which are almost as old as time itself. Now, astronomers have detected this glow — called the extragalactic background light, or EBL — and have separated out the light from later stars, isolating the contribution from the first stars that ever existed. Gamma rays interact with the EBL, which gives astronomers a means to probe the stellar content of the cosmos. Image released Nov. 1, 2012. "The EBL is the ensemble of photons generated by all the stars and also all the black holes in the universe," said astrophysicist Marco Ajello of the SLAC National Accelerator Laboratory in California, who led the research. "The EBL also includes the light of the first massive stars that ever shone. We have a fairly good knowledge of the light emitted by 'normal' stars. Thus, by measuring the EBL we are able to constrain the light of the first stars." Ajello and his team did not measure the EBL directly, but they detected it by analyzing measurements of distant black holes made by NASA's Fermi Gamma-Ray Space Telescope. Fermi studied light from objects called blazars, which are giant black holes that release copious amounts of light while gobbling up large meals of matter. "We use [blazars] as cosmic lighthouses," Ajello said. "We observe their dimming due to the EBL 'fog'. This allows us to quantify how much EBL there is between us and the blazars. As blazars are distributed across the universe, we can measure the EBL at different epochs." The study was able to probe light emitted by stars that existed when the universe was just 0.6 billion years old or so — relatively an infant. 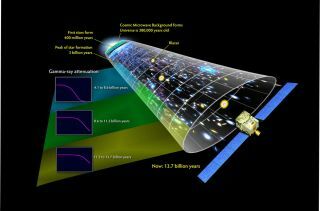 The new measurements should help astronomers answer some of their most basic questions about the first generations of stars, such as how quickly they formed, and how soon after the birth of the universe the first stars came to be, researchers said. "We really need to understand this period," said Volker Bromm, an astronomer at the University of Texas at Austin who did not participate in the research, during a NASA press conference announcing the results. "At this point we have theoretical models, but we need to test them and constrain them." "With Fermi we have the first step into this cosmic frontier," Bromm added. Already, the scientists have found that the first stars' peak formation rate must have been lower than previously thought. This plot shows the locations of 150 blazars (green dots) used in the EBL study. Image released Nov. 1, 2012. Ultimately, the researchers would like to constrain this parameter further, and eventually to glimpse these ancient stars themselves. Future technology, such as NASA's successor to the Hubble Space Telescope, called the James Webb Space Telescope (expected to come online by 2018), should come closer to doing the job. "Detecting these stars is very important, but currently impossible," Ajello said. "The Webb Telescope in a few years might be able to see the first galaxies (not the first stars though). In this way we are already able to set constraints on the amount and role of these stars in the early universe." The findings are reported in the Nov. 2 issue of the journal Science.